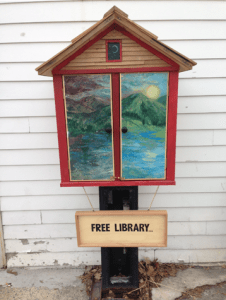 We have all heard the expression, “Nothing in life is free,” and “If it seems too good to be true, it probably is.” This is simply not the case with Little Free Libraries. Have you seen one in your neighborhood yet? Little Free Libraries have been a growing phenomenon since the first one was established in 2009 by Todd Bol of Hudson, Wisconsin. He built the original one-room schoolhouse model as a tribute to his mother, Esther, a retired teacher who loved reading and books. 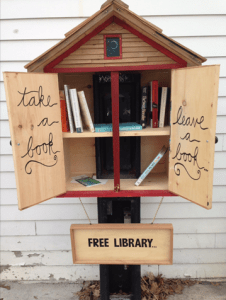 Rick Brooks of UW Madison got involved and the two men, who were inspired by Andrew Carnegie and the many “take a book, leave a book” collections in public areas, set a goal of 2508 Little Free Libraries by the end of 2013. (Carnegie had previously set and achieved a goal of funding 2508 free public libraries across the world). 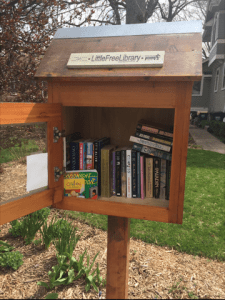 This new movement grew slowly at first, but Bol and Madison easily surpassed that first goal more than a year earlier, and today there are more than 50,000 Little Free Libraries across the USA. I was a bit late to the party on this, but I’ve been fascinated with these since I saw my first one in 2014 in Woodstock, New York. I took photos (see below) and thought at the time that it was one-of-a-kind. Much later, I saw some in my own suburban area, did a little research, and found out about this nationwide practice. I loved it from the start! I’m also a teacher, a reader and lover of books, and I would have been elated to see these in the neighborhoods that I grew up in, especially since I lived far away from the library. My mom taught me to read very young, but I wasn’t raised in a house with books, so I relied on the school library, the summer visits by the bookmobile, and the rare trip to the public library. I honestly believe that what I’ve learned from books that I’ve read on my own has impacted my life more than anything else, even more than school. I plan to establish my own Little Free Library in the coming months (I have a few hurdles to clear first), but in the meantime, I smile every day when I pass the one pictured below on my way to work. I was able to track down and speak to the owner via the Little Free Library website, and I am so glad I took the time to connect to my lovely neighbor, Linda, through books. This entry was posted in Blog, Personal Narrative and tagged book-sharing, library, Lisa Cottrell, Little Free Library.